Ah, the Beehive… ‘a slide projector that fell on a wedding cake that fell on a waterwheel’. 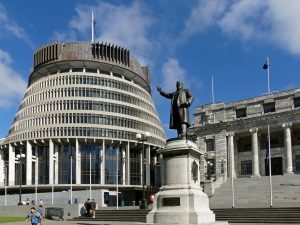 It wasn’t actually modelled on a Beehive, but the analogy is obviously good given its shape and all the government people who buzz around inside. 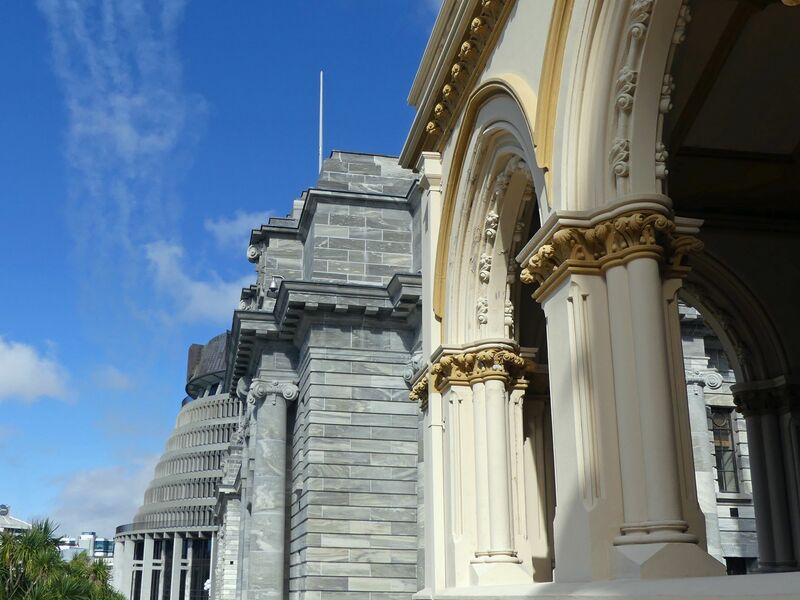 Th e first Parliament Building in Wellington was a grand Victorian Gothic affair. Unfortunately it was built of wood and it burned down in 1907! 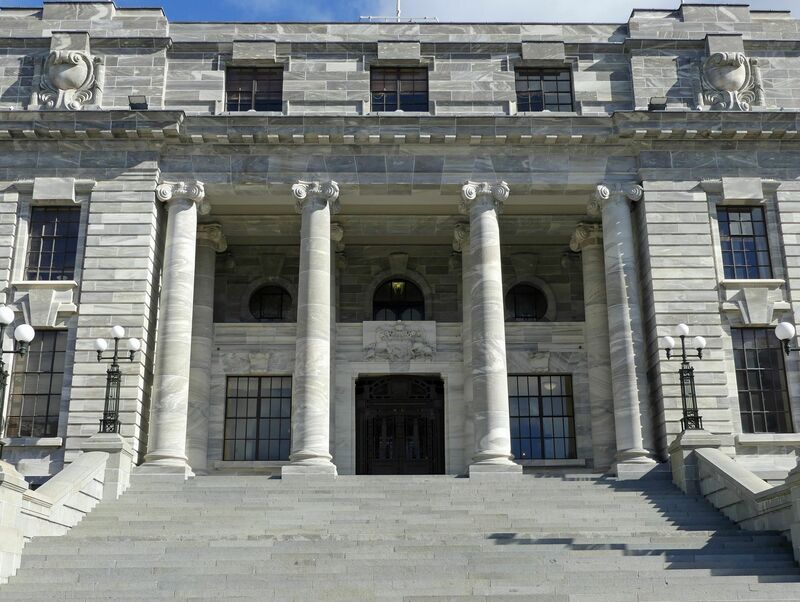 Happily the Parliamentary Library of 1899 was built of sterner stuff, and it survived the fire. These days it sits serenely alongside its younger colleagues here. 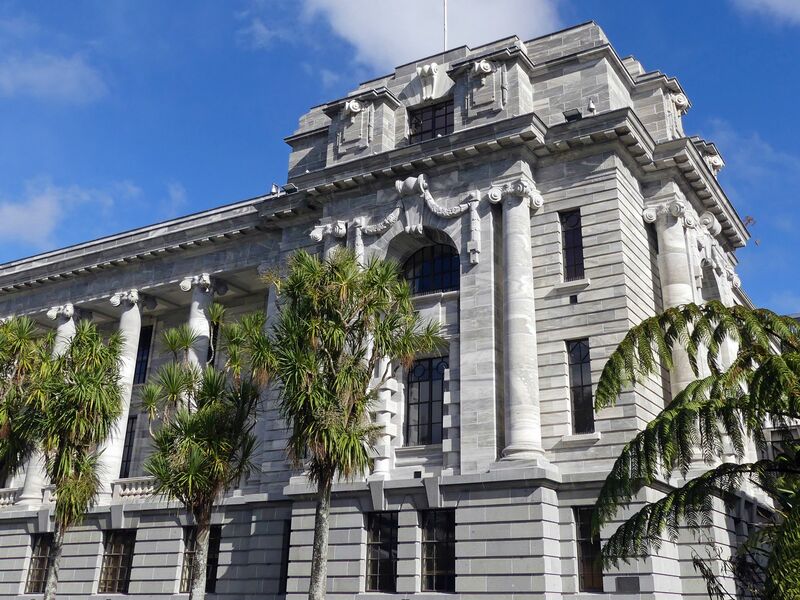 A new stone Parliamentary Building was designed to replace the old one: a grand Edwardian composition that still contains the beautiful Debating Chamber. Unfortunately financial problems led to the project being ‘staged’, so only half of it got built. Economic Depression and the upheavals of the 20th century delayed the rest of the building, and by the ’60s it felt an outmoded design…so instead, Kiwis got the Beehive. The Beehive was conceived in 1964 by Sir Basil Spence, a British architect who’d already done Coventry Cathedral and a few other post-war buildings. 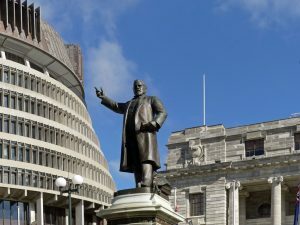 Reportedly Sir Basil was passing through Wellington one day, discussed the possibilities for the site with the minister of public works, and sketched out a plan over breakfast for a square podium with a round building on it. He returned to Britain and had nothing more to do with the scheme, leaving the New Zealand Ministry of Works to complete it. That took another 13 years. 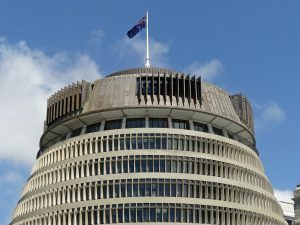 Despite the modern fashion for round council chambers, Parliament doesn’t actually sit in the Beehive. 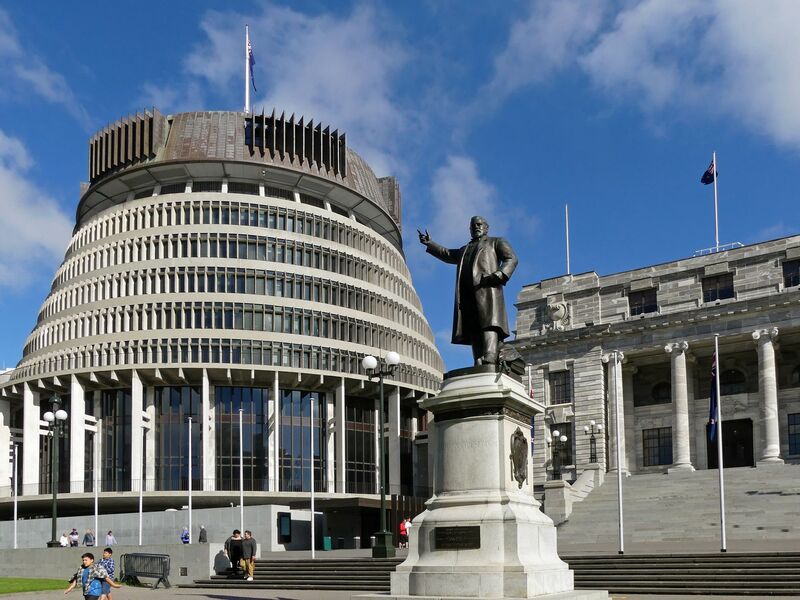 They still meet in the gorgeous old debating chamber, while the Beehive provides offices, meeting rooms and reception rooms for important functions. It even has a gym and a swimming pool in the basement! It’s an awful shape to put desks into, and it’s not designed for modern office technology; it costs a lot to run, and no-one loves it. 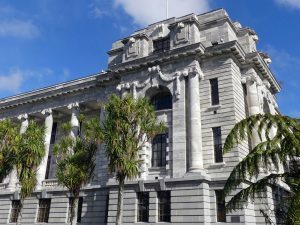 People have suggested knocking it down or even moving it (Kiwis rather enjoy putting buildings on trucks and moving them) and completing the old building. But so far the the cost of doing so has blocked further progress. Whilst most of the individual buildings are outstanding for different reasons, the overall setting that has been achieved ‘has little aesthetic or architectural coherence’. That said, the buildings are located in a very pleasant park; and as Wikipedia says, each building is impressive in its own way. If you stand in just the right spot at just the right time of day you can even made a nice photograph out of them! 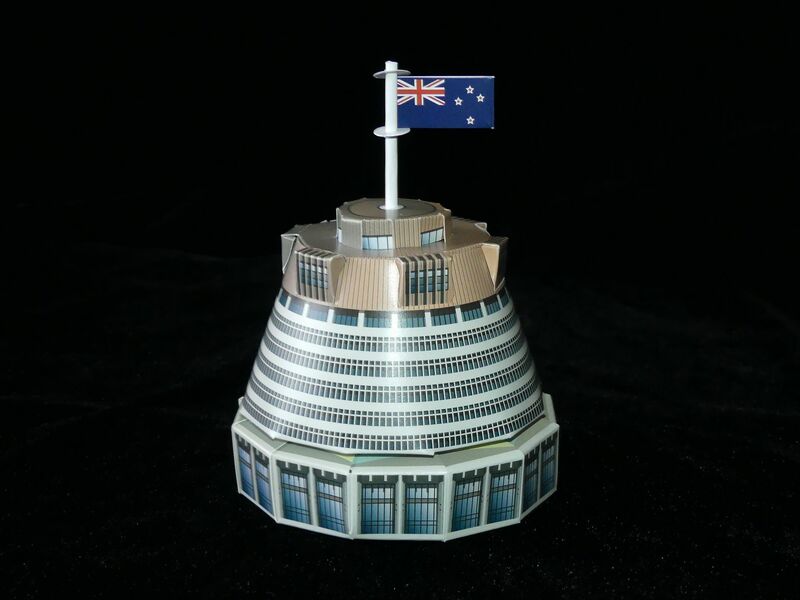 It’s very well worth doing the parliamentary tour – the buildings are lovely inside. Sadly they don’t let you take any photographs, but you can click here for the virtual tour of Parliament. Lastly…they even give away little cardboard models to make up at home…! These days Wellington is the capital city of New Zealand, but it wasn’t always so. For many years New Zealand, like other parts of the British Empire, was constituted as a collection of Provinces which governed themselves and had independent relations with the Crown. (The Australian states still technically have separate relations with the Crown, which is one reason why they can’t agree the terms for making themselves into a republic.) 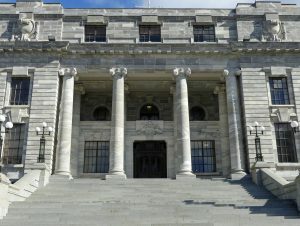 National government slowly came into being, but it was only in 1876 that the provincial governments were finally disbanded. 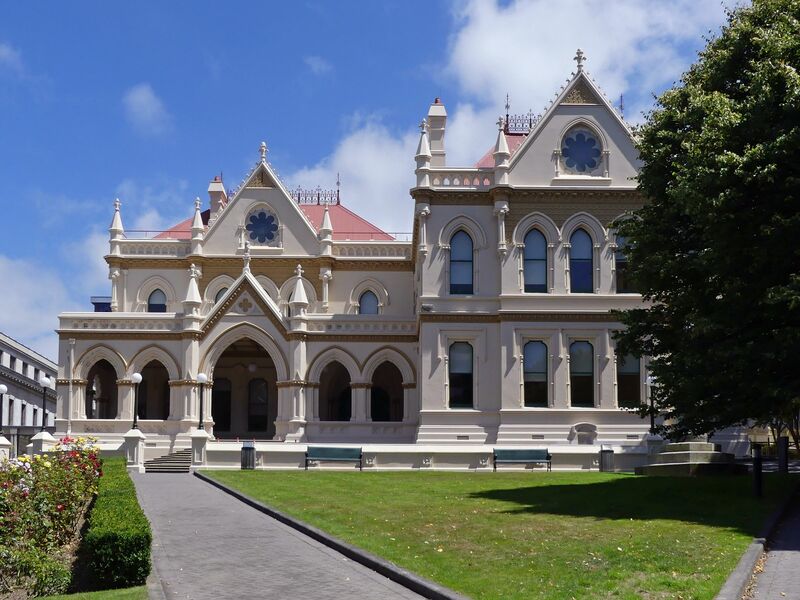 The aspirations of those administrations are very evident if you visit places like Christchurch and see the grand buildings they erected for themselves. The question of which city should be the national capital led to heated debate. Russell and Auckland in the north had been temporary capitals, but the rest of the North and South islands weren’t supportive. Wellington wasn’t really anyone’s choice, but in the end everyone accepted it as a compromise. Not such a good idea, perhaps, given Wellington’s propensity for earthquakes; and today there’s a a view that when ‘the Big One’ strikes, the capital might just move somewhere else – after all, travel would be so much easier these days. 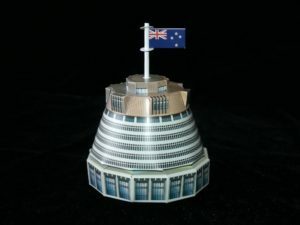 Debate continues over this but there is at least a Business Continuity Plan: when trouble comes, the Prime Minister will decamp to Devonport Naval Base in Auckland and will run the country with ‘one other minister’. That’s all it takes to run New Zealand!